Focus on Life: 52 Photos Challenge - Click HERE! 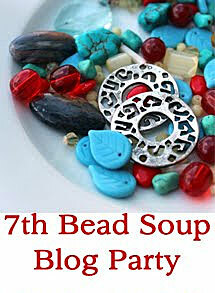 Lori Anderson's 7th Bead Soup Blog Party! 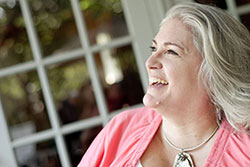 First, a super hearty thank you to our hostess, Lori Anderson who puts together the best "Soup Parties" on the planet! Lori's knack for bringing people together from all over the world is just phenomenal and with this, the 7th Bead Soup Blog Party, there are 541 participants in 28 countries on 4 continents having fun creating fabulous designs of all kinds with heaps of 'beads soups' that were traded out between partners. With three 'Reveals' over the last few weeks in order to accommodate everyone who wanted to play along, my hat's off to Lori (and her hubby!) for all the hard work and coordinating efforts this huge bead party takes to make it such a success!! (and super sweet!) Francesca Watson. Francesca and I shared our 'Bead Soups' we sent each other in our posts, here and here. I'll say it again - she's super sweet - and the Bead Soup Francesca sent me was just over the top, filled to the brim of my bowl with yummy bead-goodness! Bead Soup I received from Francesca! However, I was having lots of fun playing around with all the beads Francesca had sent and was truly enjoying all their wonderful colors and shapes. The first necklace I finished has the beautiful stone pendant that Francesca sent along with several of the gemstone beads she sent as well. I love the colors and texture and how this necklace feels when it's on (it feels fabulous!!). I really wanted to somehow make a brass backing/bezel for it in order to highlight it a bit more, but I need to get some thinner gauge metal sheet to do this. The sheet I have is so thick I can't cut it w/anything but a jewelry saw and (luckily) I'm out of saw blades (because my sawing skills are horrible. That's a compliment, trust me!). My hubby says this one has my sister written all over it - color and texture wise - and I think he's right! Here's the earrings I created to go with the necklace. 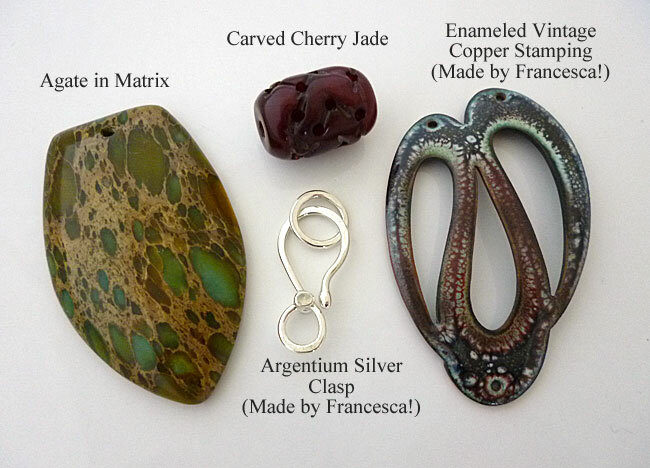 Next, I took the amazing copper enameled (2nd) focal pendant that Francesca sent me and played around with it. I actually thought that most of the beads she sent would look fabulous all knotted in waxed linen in a multi-strand necklace with this focal. They did look fabulous all knotted, but again, the design just wasn't doing it for me, so that's another one of the designs that got scrapped. I ended up creating these tube-shaped paper beads from a magazine add that had a picture of the Grand Canyon it - the colors match perfectly and really (my opinion here) let the focal pendant take center stage. I also used the third focal that Francesca sent me - the carved, dyed horn bead - as one of the beads in the necklace - I just LOVE this bead! It was hard not to make that bead the focal of a hand-knotted/beaded type of wrap bracelet, let me tell you, but I was trying to steer away from my 'usual' here,....at least a tiny bit anyway! I'm so in love with this necklace! I could wear this every day of the week!! I've got a ton (yes a TON) of beads left over from the wonderful bead soup that Francesca sent me and I've got a couple of bracelets and earrings in the works using them, but nothing to show off as of yet. 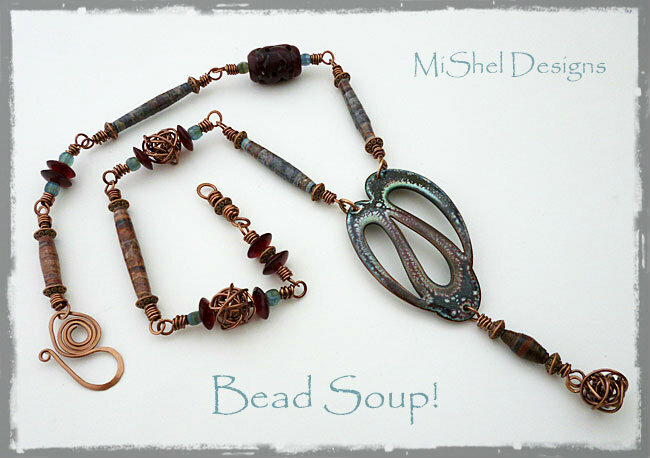 I want to thank Francesca for sending such a lovely soup recipe to me and for allowing me to step out of my box a bit and try some shapes and colors of beads that I don't normally try and also for the wonderful focal pendants and clasp she sent me - I couldn't have asked for components that were more beautiful or fun! 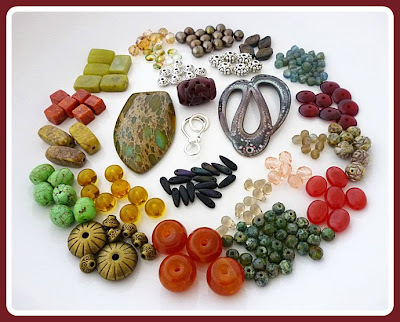 Please stop by Francesca's Blog and see what she has cooked up with the beads I sent her - I know it will be wonderful - her designs always are! and see the 3rd Reveal Participants with their links so you can hop around the 'world' (literally) and drool over all the amazing soups that everyone else has simmering! Thanks again to Lori Anderson for another successful and super fun Bead Soup Blog Party! Peace, Love and Bead Soup Fun! Loved all the designs, and super loved your paper beads! Awesssssssssssssome! I want to see some closeups of them if possible...whenever possible! Yep - there's orange Kashmira - and I'm lovin' it!! I'll take some close up pics this week of the paper beads and send them to you via email along with a video link I watched a couple years back on making them - super easy, super fun and you can make just the right colors for yourself should you ever be out of beads in a certain color! You received a beautiful bead soup and made it justice! Your pieces are fabolous and I would love to wear any of them! Thanks and yes,...she wants that first necklace - she told me so when she saw it!! 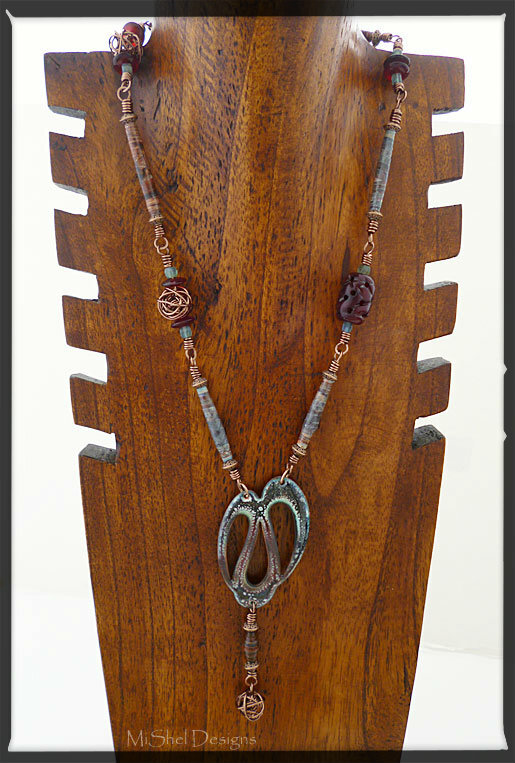 Wow all your pieces are stunning, I especially love the necklace with our paperbeads, all the elements go so well together. Great soup! Thank you so much Reginia! Lovely work with Francesca's soup Michelle! That first necklace is especially stunning and I love the earrings. Thank you so much Lisa! I loved how you did a video on your blog for your soup - it was awesome! WOW! You received a great Soup and you made a sumptuous meal out of it!!! Each of your pieces has great charm and beauty. Those paper beads worked out perfectly. Your re-do struggles were well worth it. Beautiful creations!! I would totally wear these! Great colours, shapes and texture. Great job! Thanks so much Nan. I loved you little spoon earrings on your post (I forgot to tell you that) those are just too fun for a 'soup party'!! Beautiful, beautiful work as always. Your work is always spectacular and this is no exception. Love those paper beads - I've got to learn how to do that! Thank you Linda. I found a you tube video a couple years back and it showed how to color your own, but you can do it with newspaper, magazines,...what ever you want. Kristal Wick's book, Fabulous Fabric Beads, is super for fabric ones! Love what you made with the soup especially the first necklace. Your bead wrapping skills are amazing!!! What a delicious soup mix Francesca sent you. So many recipes to create! 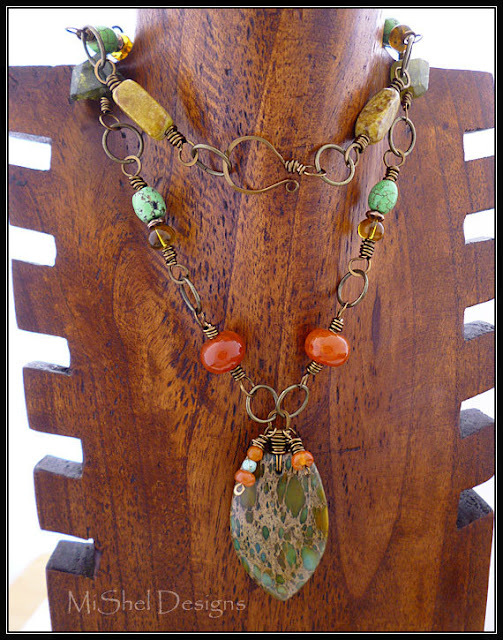 The first necklace is my favorite - how you mixed the stones; beautiful complement to the focal. And love the extra long wire wraps adding another element of texture. Great job!! Thanks a bunch Lynda,...the last one is my favorite, too. I think because it's so 'out of the norm' for me design-wise, but the colors are, like I said, some of myfavorite!! Wonderful Design on all your gorgeous pieces. What a FABULOUS Soup! The colors are so beautiful! Love your pieces! I'm so happy you like the designs. The first one is for my sister - it's got her name written all over it - but the one with the enameled focal you made,...that's mine! :-) I absolutely adore the necklace you created w/the soup I sent! It's fabulous in every sense of the word! I've really enjoyed having you as a bead soup partner and am so glad we were paired up!! 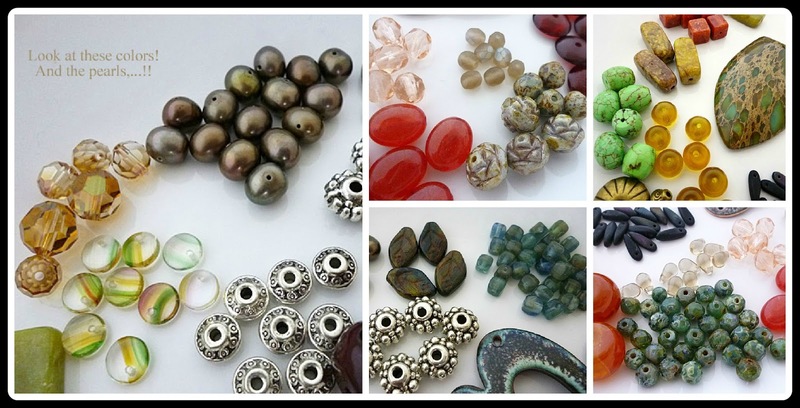 I've got tons of beads left over, too - I'm excited to use some of those dagger shaped Czech glass beads, those are so cool!! thanks again!! 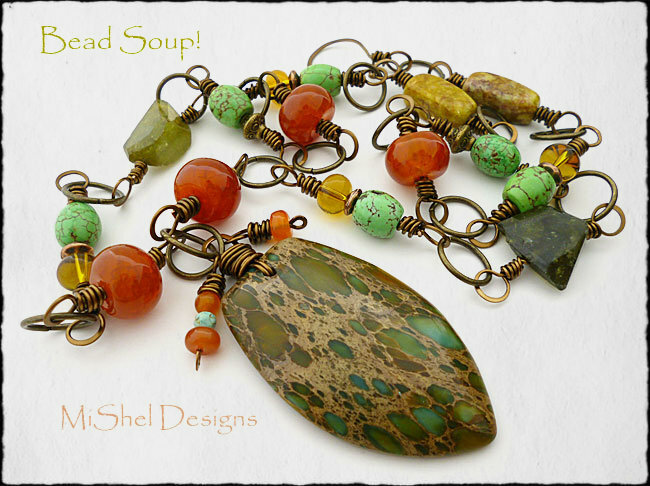 What a gorgeous soup you made with your beads. Love those earrings too. They compliment the necklace so well. Nice touch adding the details of the dangles hanging from the focal's bail. And I have to say that I adore your wooden necklace form ... would love to have something like that for myself. Awesome Shel. You created wonderful designs. You should not say you don't have skill. Your pieces are beautiful. Love your Grand Cannon beads. What a creative idea. Thanks Mary! I loved those orange beads when I saw them in the soup Francesca sent and my friend Kashmira has just sent me some earrings with orange beads, so I knew I had to use them and they went perfectly w/all the greens in that first necklace. super work with wire! congratulations! Love every single piece, but especially the earrings. Beautiful! That first necklace is stunning!! The link size, the colors, the focal, they all work so well together. The matching earrings are great too. 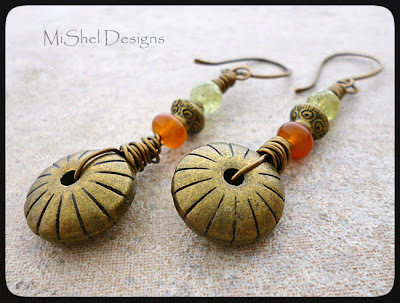 I love that you made your own paper beads to use with the other focal. Great designs! What great designs! I thought that the first necklace was good but I totally fell in love with the second one. Oh, thank you Shaiha, that one's my favorite, too!! You made an amazing work, love each piece - how nice the paper beads!such clever idea!!! I love them all. The first nechlace and the matching earrings are so beautiful! Great job. These are beautiful and modern designs. I love the first necklace - it reminds me of Africa. Great work. I'm drooling over all of your servings... You really did justice to the goodies you received! I love your designs! I really admire your wire work - love those larger loops! Beautiful jewellery! It all looks fab, but I must say the enamelled focal necklace is my favourite -- great job! I loved seeing what you made with Francesca's bead soup. Your pieces are absolutely stunning and I'd wear them in a heartbeat! I especially love all of the wirework! Gorgeous pieces, all so unique. Amazing designs! The last piece, the bracelet is exactly my style and color - love it! Hmhm, that orange and green went together so well - I love this combination. But also your paper tube bead necklace is georgeous! You really made some stunning creations with your soup, Shel! Love your use of colour- such pretty pieces. Wow, you got a pot of soup...beautiful designs I really love the green pair too!!! Wow! Your pieces are beautiful...great designs! You did a fantastic job! You got a lovely colorful soup, and made some great designs with it. I love the beaded bracelet on waxed linen...I bet it feels nice on, too. That soup looks like you hit a bead jackpot! Let me apologize for taking so long to get over here for your reveal. It seems to be taking me FOREVER to hop all these blogs. Your designs are exceptional!! I wouldn't have expected any less though. 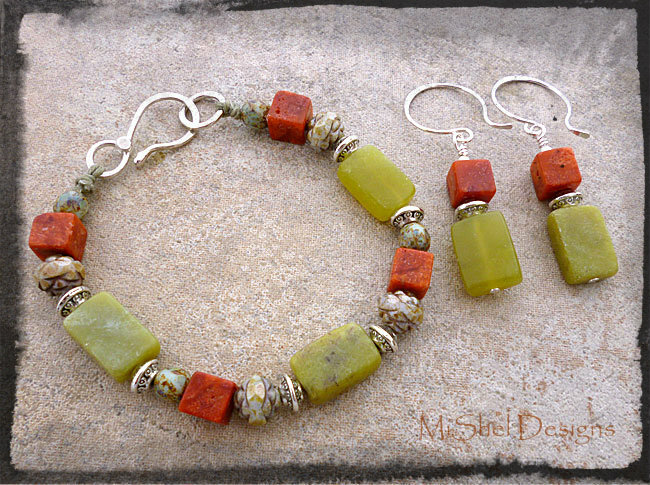 I love that you added the orange and yellow beads to the green focal in the first necklace. Somehow it makes the whole necklace just POP! And that second one is simply awesome. Those paper beads you made are just TOO COOL! Ingenious! All of it came together so well.